How to Install Yii on Ubuntu 16.04 LTS? Yii is a high performance, component-based PHP framework. It is used to develop modern web application rapidly. The name Yii is an acronym for Yes It Is! In this tutorial, we will install Yii. Before installing make sure, we meet all the given prerequisites. We are using composer to install Yii, the following command is used to create application. $ composer global require "fxp/composer-asset-plugin:^1.3.1"
Use the following command to get application. 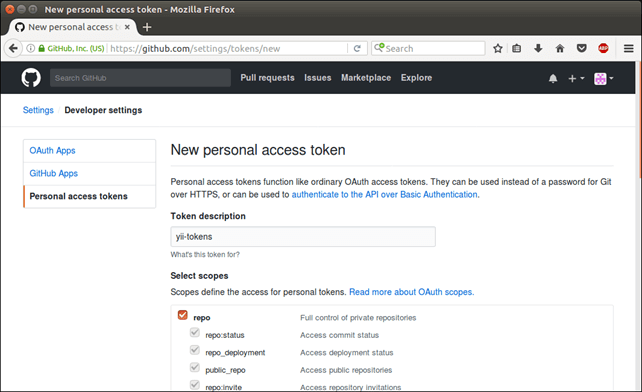 It will ask for hidden tokens that are used to get API permission from the GitHub. We can get these tokens from the Github.com by login our Git account. Following is the sequence that we need to follow to generate tokens. go to user profile → select settings → Developer settings → Personal access tokens → generate new tokens. It will open the following form. Scroll to down page and click on Generate token button. It will create a token that looks like the following. Copy these tokens and paste into the terminal where process asking for hidden tokens. Tokens will not display, so just press enter. 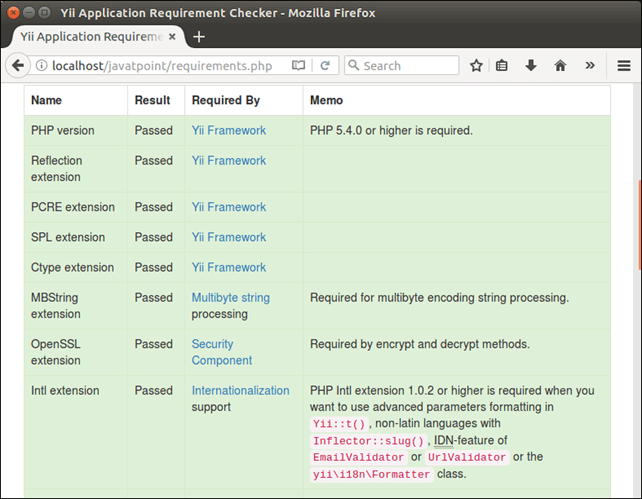 After this process, an application javatpoint is created. We can access it to the browser by using localhost/javatpoint/web/. It will show a home page that looks like the following. This application contains a requirements.php file that can be used to check that our application meets all its requirements or not. Use localhost/javatpoint/requirements.php to the browser and it will display following output. 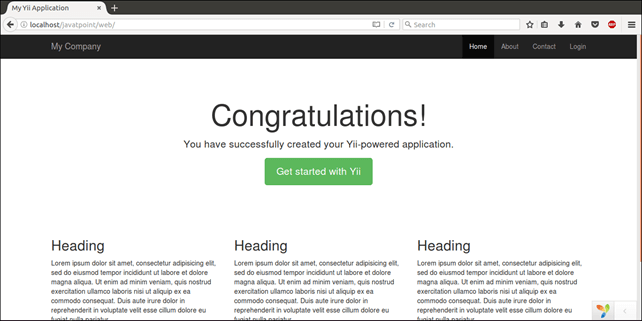 Well, we have created a fresh Yii application. Now, we can design and developed it according to our requirement.